Ald. Bob Fioretti of the Second Ward has the platform of "True TIF Reform" for his mayoral campaign. I spoke with him over the phone on Friday to discuss TIFs and how to reform them. One of your platforms is "True TIF Reform." 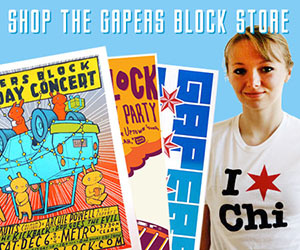 What projects under Mayor Emanuel have led to you developing this platform? A meeting -- I think it was the Finance Committee meeting, I do not serve on the Finance Committee -- and I watched what happened with a TIF on the Far West Side where the aldermen had not done anything to improve the infrastructure. And many African-American aldermen complained about the lack of use in terms of the infrastructure and at that point I had come to the realization as I watched what happened our TIF program is broken. I mean, it's there to help blighted areas and instead we see most of the money being directed to the South Loop, West Loop, Downtown area. And, accordingly, short-changing our neighborhoods like Pullman, Riverdale, Roseland, West Pullman, South Side communities where blight is, as I said before, prevalent and economic development is scarce. The TIF Illumination Project is a new crowd-sourcing effort dedicated to investigating Chicago's Tax Increment Financing (TIF) districts. Tom Tresser, a Chicagoan and veteran civic organizer, is leading the project. The goal of the TIF Illumination Project is to give local residents a better idea of how TIF funds are used. "You have to force the city to explain themselves, and I don't think they're going to be able to do it in a really convincing manner," said Tresser in an interview earlier this week. "I don't think this program is going to hold up to scrutiny." 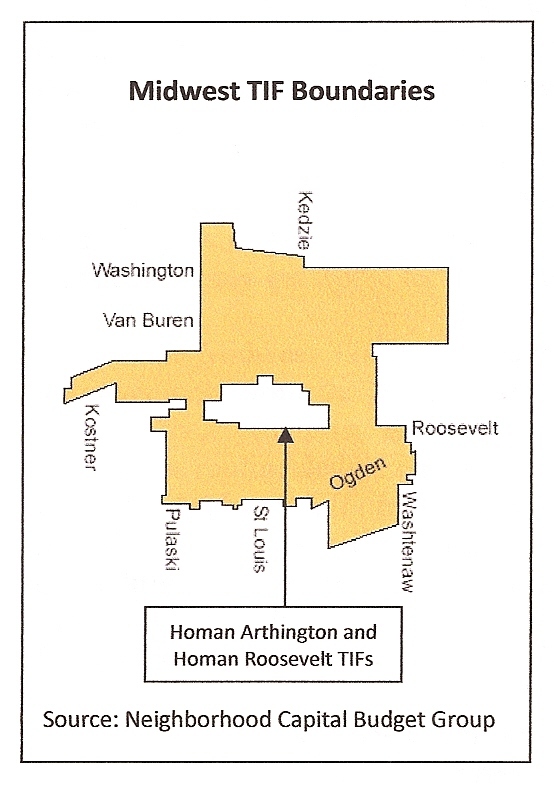 Chicago began using TIF districts as an economic development tool in 1984. A TIF freezes the amount of property taxes schools and local government take in from a set district for a 23-year period. New tax revenue generated from increased property values is diverted into funds used by the city. Those funds must be used within the district or a bordering district. The TIF Illumination Project has started examining the TIF districts in the 27th Ward. They research how much revenue the TIF received and where the money went. Then volunteers will call each recipient and ask how the money was spent. "I'm imaging that most people are going to hang up on them," Tresser said, but added, "I'd like to get people up on the balls of their feet about this." Tresser emphasized that the project is not only about research. "We're not just building an app or running a program and letting it go. We want to take our findings into the community." Tresser will be speaking in a town meeting organized by the Tax Integrity and Fairness (TIF) Alliance on Tuesday, February 12th from 7-9pm. He will be speaking alongside Ben Joravsky and Dr. Richard Dry. The evening will include time for break out sessions, including one lead by Tresser titled "Become a TIF Illuminator." The TIF Illumination Project also plans to run a flier insert in AREA magazine's housing issue in early March. The inserts will explain TIF districts and the revenue they generate in the neighborhood, and invite the public to take part in the project. Tresser sees a potential for the project to grow, but emphasized the importance of it being a local effort. "This is where you live. This is your house. This is your property tax bill. Let's start with that." As the education privatization reforms spread across the country (from Chicago via D.C.), a report out of Roosevelt University threatens to add fuel to the fire of privatization critics, particularly here in Chicago. The study, by sociology professor Stephanie Farmer, examines how tax increment financing (TIF) funds have been spent on schools. TIFs are controversial financing mechanisms originally created to allow cities to fund development in blighted areas by dedicating property values above a specific amount to projects within those areas. Thanks in no small degree to the work of Ben Joravsky of the Reader (and the now-defunct and terribly named Neighborhood Capital Budget Group), TIFs came to the public attention as de facto slush funds, with little or no oversight, used to divert property tax revenue (mostly from the schools) to be used as "incentives" or givebacks to developers. Because the revenues diverted into funds come from property taxes, the Chicago Public School systems has consistently been the biggest loser in the TIF craze. CPS's top priority for the allocation of TIF revenues to school construction projects is to support selective enrollment schools....Though selective enrollment schools account for 1% of all CPS schools, they received 24% of all TIF funds spent on school construction projects. It is hard to merely call it a "perception" that TIFs have been abused to accelerate gentrification, thus substituting displacement for economic development. That selective enrollment and charter schools received more than a third of all TIF funds spent on school construction and improvement projects isn't just an isolated fact. School quality is a strong, if not the strongest, component that determines not only property values but the attitude of young families and professionals to a neighborhood. Therefore diverting funds from CPS by creating a TIF, and then disproportionately spending that TIF money on already-elite schools actively harms the city's working class neighborhoods. The Golden Toilet Strikes Back! 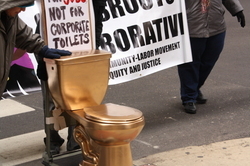 Protesters brought out the golden toilet once again in a rally aimed at Mayor Rahm Emanuel, demanding that he designate TIF funds towards jobs at schools, libraries and clinics. The gilded john was marched to City Hall, where protesters associated with the Grassroots Collaborative were told it needed to stay outside. Are Rahm's Proposed TIF Reforms Enough? This week, Mayor Rahm Emanuel announced that he will be immediately implementing some of the reforms proposed by his Tax Increment Financing (TIF) Reform Panel five months ago. All of the proposed reforms are necessary to fix TIF and need to become law before more of our tax dollars are wasted. Every year, $500 million worth of property tax revenue collected from Chicago taxpayers flows into a funding pool that, up until very recently, has been completely off the books--allowing for an out-of-control spending spree to well-connected developers and other special interests. Phil Rosenthal had a great piece in the Trib about the core policy questions that arise in the debate about TIF: Who needs subsidies? Working families? Or big companies? On the one hand, you have unceasing waves of foreclosures hitting Chicago neighborhoods, contributing to blight, affecting property values, and, most importantly, putting families out of their homes. Without question, these harm a local economy. On the other, communities need jobs. The flight of manufacturing from Chicago degraded the city's middle class significantly, and only an infusion of professionals to gentrifying neighborhoods has kept the median income steady. If employers are only willing to relocate with lavish subsidy, whatever our ideological or moral objections, it may be necessary. "It depends on how you view the geography of our economy," said Rachel Weber, an associate professor in urban planning and policy at UIC. "If you think of the upper Midwest as one interlinked economy that competes with Europe and China, then moving these pieces around is not necessarily a benefit. If you look at it from the perspective of the city of Chicago, this is a winner. It depends on the scale of the economy you think matters most." Beyond the process concerns, one of the challenges that TIF-style economic development presents is stability. TIFs are a weapon in the battle between communities and states to lure business away from one another, which changes the net but does nothing to the gross: the pie doesn't grow, in other words, between regions and states. How many subsidies are enough? What's to keep a company willing and able to chase the best benefits from staying put long enough to truly plan around? Mayor Emanuel, like his predecessor (whose name is not "Mayor My Predecessor" as Emanuel would have you believe), has an intense policy focus on keeping Chicago a "global city." As the global economy has become more and more integrated and capital freed from parochial bonds since the 1970s, the "global city" idea has majorly informed of metropolitan areas has formed the basis of urban planning. [T]he forty or so cities that currently qualify as 'global cities' fulfil three major functions. They are command and control centres for the organisation of the world economy, key locations and marketplaces for finance and specialised services, and also major sites of production, including the production of innovation. [Sassen] stresses that global cities cannot be treated as single entities and that their social and cultural determinants must be taken into account to understand their economic trajectories. The intense specialization and capital requirements of these functions requires significant infrastructure and social capital investment. Like the human brain, they consume a lot of resources. The professionals and the social networks in which they move require certain modes of urban living, access to major research institutions, access to power, and generally little interference from the state. Requirements like these often come to the detriment of the type of "neighborhoods first" governance that was the center piece of Harold Washington's reforms in the 1980s. Thus the constant friction between funding for "downtown" and Millennium Park versus investment into "the neighborhoods" and relief for cash-strapped families. Competition for international capital and the industries, social networks, and professionals that accompany it is only sharpening. What's more, the policies needed to compete can seem to the public to be a series of desperation measures to stay relevant, with investment in working class communities forever put off into some future where there is some stability. And if the fictional wealth bonanza of the 1990s taught us anything, even seemingly dynamic changes to the fundamentals of the economy can be illusory. The example in Chicago is stark: the collapse of the housing market led directly to the tanking of Chicago's revenue base which was kept afloat by huge surges in Real Estate Transfer taxes. The race to the bottom indicates there is a bottom, but the analogy can't be stretched too far. In reality, what is considered an acceptable level of social spending is constantly revised downward, the public common is consistently narrowed, and neighborhood participation in planning low-rated into oblivion. Still, the abuse of TIFs by Mayor My Predecessor has given them a bad name, but they are not by any means inherently bad. To the contrary; one can easily imagine how TIF districts could be used as a tool for community control over and input into local planning and development decisions. A first step to resolving the type of tension Rosenthal reported on is to work towards some kind of consensus on the question of what makes a city prosperous, and to what degree our "global city" position needs to be balanced with true local ownership over policy and planning. What jumped out at me was Brown saying that the public was mistaken in believing that tax increment financing districts were meant only to address blight. An area being blighted is actually in the TIF statute as among the necessary conditions for creation of a TIF. Hard to see how those statements can both be reconciled. Where Do We TIF From Here? Chicago is perhaps the best place in the country to see the impact, both good and bad, that Tax Increment Financing districts can have on a city. 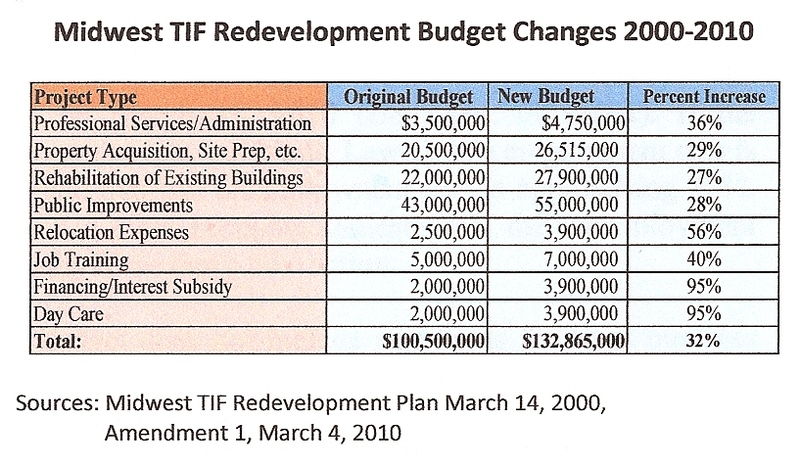 TIF districts - those peculiar redevelopment schemes that hold the line on current property taxes within a designated area, and then funnel all future property tax increases straight back into redevelopment (as opposed to financing basic public services) - were nearly always on standby during Mayor Richard M. Daley's tenure. At their best, Daley's TIFs solidified the tax base and quarterbacked increased development in certain areas, most vividly seen in the Central Loop TIF. Begun by Mayor Harold Washington in 1984, when the Loop did indeed contain areas of blight, Daley extended the life of the Central Loop TIF to seemingly great effect. Before eventually expiring in 2008, the TIF district helped spearhead the Loop's renewal, ushering in an era of huge expansion that increased the tax base and businesses within its borders, and saw a rise in the estimated assessed land value in the district to $2.6 billion from its original $985 million. The renewed strength and vibrancy of Chicago's core allowed the city to comeback from its "buckle-on-the-Rust-Belt" lows, and become a relevant player on the Global City index. Of course, the Central Loop TIF is but a tiny part of the story. While TIFs can be great vehicles of investment in neighborhoods, often they are not the simple fix for areas that they portend to be. For starters, the subjective assignment and creation of TIF districts skews the market and incentives for development where demand is inherent. In Chicago, where the disparity between TIF districts is immense, one man's blight is another man's aspiration. Nearly no one would argue with the fact that the destitute area surrounding the Ogden/Pulaski TIF district in the Lawndale neighborhood displays a greater need for subsidy-induced development than Chicago's Loop. Yet, Daley's downtown focus ensured that the "blighted" CBD continued to be invested via TIF well-beyond its logical expiration. The Emanuel administration is still settling in, but some changes are already showing up online. The City's data portal now offers an RSS feed of newly created and updated data sets, and the portal is moving beyond FOIA requests to include other data sets, such as the 20 most popular fiction books checked out of the Chicago Public Library and a huge cache of TIF-related documents. Chief Technology Officer John Tolva said by instant message, "We're only dribbling now. Expect a steady stream." Starting today with the release of building permits data, Tolva said his department plans to being "what we believe will be every-other-day releases of nightly updated sets." In addition, Tolva and Chief Data Officer Brett Goldstein now have Twitter accounts. Goldstein recently tweeted a link to the City's Open Data API console, where, if you're technically inclined, you may query the database directly. "We're releasing all this for many reasons, transparency/trust, accountability/efficiency, but also -- and this is important to Brett and I -- to engage makers in building things and helping the city -- providing the public resource for a new kind of civic engagement," Tolva said. As more substantial data is released, we can expect developers and urban technologists to create tools for exploring and working with the information, much like we saw once the CTA allowed developers access to their bus tracker API. Big news last week for the Chicago steel industry when US steel producer A. Finkl & Sons Co. received a hefty chunk of change -- $20.5 million - from the city's Community Development Commission in TIF money to move operations to the former South Side site of Verson Steel (instead of picking up and moving to Canada). Tax Increment Financing (TIF) is a hot-button issue in Chicago, as many city officials, including outgoing Mayor Richard M. Daley, favor it as a way to incent local business development to spruce up blighted neighborhoods, while detractors say the property tax freeze that the government offers on these properties diverts money from local schools (yet somehow manages to get funneled into the pockets of Daley officials and their favorite developers). Going with the higher number of 500 jobs, that comes out to about $40,000 per job. Finkl's new digs will be at 93rd and Kimbark on the far South Side, in the 8th Ward. On first inspection, this looks like exactly the type of thing that tax increment financing was meant to do--but of course, first inspections are rarely determinative. Still, in all the heat over TIFs, it's good to look at cases such as this to determine just how the program can be used to serve the public good. But I'm open to arguments to the contrary--what do you think? On its face, the proposal would ameliorate the social repercussions of the foreclosure crisis, while also achieving to some degree "scattered site" affordable housing, which is key to breaking the pattern of ghettoizing the city by social class and race. There is some evidence that residents have more incentive to take care of and protect their residences in scattered-site programs. One question that comes to mind: would relying on TIF money to maintain a scattered-site housing program prevent needed reforms to the TIF program? State Representative John Fritchey, who will be giving up his seat in the state house representing the 11th District to replace Forrest Claypool on the Cook County Board of Commissioners (assuming he wins in November), is teaming up with the Chicago Teachers Union and the Raise Your Hand Coalition to push comprehensive reform of the tax increment financing, or TIF, program. The reforms could end the exploitation of TIFs by the Mayor's office as a cudgel, and restore significant funds to taxing bodies--particularly the schools--that have seen billions of dollars disappear over the last couple decades. Tax increment financing was created by state statute in the 1970s as a way to provide incentives to develop blighted areas. TIF areas are designated by municipalities; within those areas, property tax assessments are frozen at the level they were at when the zone was designated. The land is still assessed and the taxes on the increase are still collected, but they are diverted into a site-specific fund rather than being paid to the various taxing bodies that typically collect them. Those bodies are, primarily, school districts, counties, the municipality itself, and sanitation and fire districts, among others. The idea is that without the incentive, that tax money would never have been raised in the first place, and so those taxing bodies are not actually losing anything. The city's Inspector General, Joseph Ferguson, sent the Mayor an audit on several city TIFs, and the result confirms what TIF critics have been saying: that no matter what the potential benefits of so much TIF creation, the lack of transparency both to the public and to public officials is leading to waste and corruption. TIFs, or Tax Increment Financing districts, are special taxing districts that freeze the property taxes paid to the usual taxing bodies (mainly the school district, County, and park district) and diverts that money into a special account meant to finance development. The report, dated yesterday, details numerous ways the lack of public accounting for the TIF funds resulted in wasteful spending, abuses, and corruption. The audit criticizes the city for lacking sufficient "internal controls" as required by the state statute that authorizes cities to create TIFs. Of the litany of problems with TIF management the IG cites, this one jumps out: "Decisions to move money from one TIF district to another contiguous district--so called 'porting' of funds--are not adequately documented and are made without sufficient transparency to assure adequate accountability and public scrutiny." The porting of TIF funds between contiguous districts is what changes TIFs from a tool for development into a de facto shadow budget. The justification for porting is meager, and the impact is enormous: a look at the city's TIF districts shows that contiguity is common. Since TIFs are meant to eliminate concentrated blight (with a creation process take that targeting as an assumption), porting money from one district to another defeats the purpose of the program. The principal developer of the proposed massive redevelopment at the former U.S. Steel South Works site, McCaffrey Interests, lost one of their featured developments, The Market Common Myrtle Beach, to foreclosure last week. The project--termed, perhaps ominously, The Market Common SouthShore--will feature nearly 14,000 new residential units, 800,000 square feet of retail and residential construction, and a 1,500 slip marina (finally!). 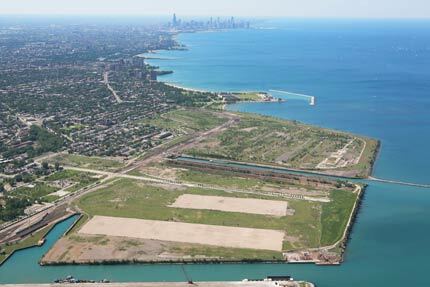 Covering nearly 400 acres of a recently industrial zoned lakefront area, the Market Common SouthShore will rely on a massive $96m TIF subsidy and be developed in several phases over the next 20-45 years. The Market Common Myrtle Beach site also used TIF dollars. Since 2000, McCaffrey Interests has given $27,100 to local campaign committees, including $3,850 to 10th Ward Alderman John Pope, $7,900 to Finance Committee Chair Ed Burke, $2,550 to 7th Ward Alderman Sandi Jackson, and $5,000 to Mayor Daley. Obviously all four of these local pols would have direct input into the Market Common plan. The City's Plan Commission granted approval to the first phase of the project on April 21st, and the Community Development Commission gave their blessing on May 11--just a couple of days before the Myrtle Beach foreclosure. Given its scope and cost, the Market Common could end up changing the South Side Lakefront completely. We'll be looking a little more closely at the plans over the coming weeks. A spreadsheet of McCaffrey's political giving is below the fold. This Op-Ed was contributed by Valerie F. Leonard, a community development consultant on the city's West Side. The City Council approved an ordinance on April 14, 2010 to increase the redevelopment budget for the Midwest TIF district from $100,500,000 to $132,865,000. This represents a 32% increase from the district's original budget. The City of Chicago's Projected TIF Balances Report 2009-2011 indicates that the Midwest TIF is projected to have a cash deficit of -$6,842,003 at the end of 2010 if every project on the schedule is implememented, and projected 2010 incremental tax revenues of $13,000,000 materialize. The projected deficit is expected to grow to -$7,213,492 by the end of 2011. Chicago Journal editor Micah Maidenburg digs into a $59m South Loop TIF to find out just how the money there will be spent. One of the first, I imagine, of many such stories as the public turns their attention to the administration's "shadow budget". Even as the Calumet-Cermak district faces its demise, the city is negotiating with an unnamed private entity for a future potential TIF-supported project in the Calumet and Cermak area. The existence of that project was made public on a list the Chicago Reader obtained through the Freedom of Information Act and recently published online. The list, which the city has now posted to its Web site, shows various projects that tax increment financing dollars will fund or potentially fund through 2011. "What do we want? Affordable housing!" Members of the Coalition, which unites three unions and nine community organizations, marched outside of Firoetti's office, urging the alderman to support an ordinance that requires 20 percent of future money generated from tax increment financing districts (TIFs) go toward affordable housing. In a TIF district, property taxes are frozen, freeing up money that would normally go to schools or parks in order to spur development in "blighted" areas. 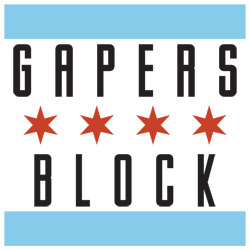 But the city's management of these funds has come under scrutiny lately, thanks to the tireless work of Ben Joravsky and Mick Dumke of the Chicago Reader, the Block 37 fiasco and thoughtful tracking from Progress Illinois. According to the Coalition, Firoetti has supported TIF subsidies for wealthy corporations but has yet to support TIF funding for affordable housing. The Coalition released a report today (.pdf) showing that $91.8 million in city funds designated for these "blighted" areas instead has gone toward offices for companies that average billions of dollars in profits. According to the report, Firoetti has supported six of the ten projects the Coalition reviewed. In addition, members of the Coalition argue that if the $91.8 million instead went toward affordable housing, 2,944 residents could have received accommodation. While the 20 percent won't fix all of the city's affordable housing woes, Julie Dworkin, director of policy for the Chicago Coalition for the Homeless, argues that it's a strong step toward creating more permanent affordable housing. "We decided that would be an adequate amount to spend on housing," she says. "We thought it was realistic. We're not asking for all of the money. We're asking for something that we think would make a significant impact." Dworkin acknowledges that the ordinance is "not the whole solution," but it's the best thing the city can do now. "We're in this terrible recession," she says. "There isn't extra money lying around, except in these TIF pots. We know it's there...It's urgent right now in the recession because the need for housing is so much greater. We have this foreclosure crisis, we have unemployment rising, the numbers from Chicago Public Schools shows with homeless children, there's 25 percent more this fall than last fall, so this is the time when the need is really great...In Chicago, we've been dismantling public housing, so we have lost thousands and thousands of units through the demolition of public housing. We've been building some more, but we have not nearly made up for what's been lost." As the issue of tax increment financing (TIF) districts and the non-appropriated "shadow budget" they generate moves into mainstream media coverage, it's important to remember a couple two tree things about TIF funds, the main one being that the money in TIF accounts is not interchangeable with the money that is missing (the deficit) in the city budget. Second, TIF funds are property tax funds, and they can't just be spent however. The state statute limits what the money can be spent on. So although the Mayor controls some $1 billion in TIF funds, that money can't just be spent the same as the corporation funds the City spends on most of its budget; by state law it has to be spent inside the TIF district (or an adjacent district) and on statute-defined things. As Block 37 struggles, what happens to TIF cash? After a series of fits and starts throughout the past four decades, today's news wasn't entirely unexpected: Block 37--a planned commercial center in the Loop--is facing foreclosure. Block 37 developer Joseph Freed and Associates LLC isn't only over-budget by $34 million, but owes $128.5 million on a $205 million loan that's overdue. While this may signal all sorts of unsavory prospects for the commercial real estate market, it also raises the question of what now happens to the enormous amounts of taxpayer money invested in the project through the Central Loop TIF district. Josh Kalven of Progress Illinois digs into the business-luring TIF deal--a program the Mayor once referred to as the only game in town for economic development--and points out just one of the many problems with it: it puts the public on the hook without making any real demands on the corporations who receive our largess. It's harder to reduce your student loan payments than it is to get tens of millions of dollars of public money. Indeed, when the ink dries on the each of these deals, the debate in the press inevitably surrounds the cost-per-job estimates and the various long-term revenue projections stemming from the agreement. But what's missing is any method for examining the previous contracts. No one digs into the earlier relocations to see whether they fulfilled expectations and were ultimately worth the public investment. Instead, we're greeted with a perpetual refrain: "Trust us." "We know what we're doing." "Trust us." Judge Mary Rochford on Friday granted a request by residents group Fix Wilson Yard to file a new lawsuit against the City of Chicago and Holsten Real Estate, the developer of the project that will feature a Target store, office space and housing for low-income families and seniors. "We're trying to accomplish the same thing we've been trying to accomplish since the beginning, which is to stop the wasting of taxpayer dollars," says Thomas Ramsdell, Fix Wilson Yard's attorney. "My clients are as motivated as ever." Ramsdell said Fix Wilson Yard will file the lawsuit next Friday. The original lawsuit filed by Fix Wilson Yard in December 2008 accused the city of wrongfully establishing a tax increment financing district to fund the project. TIFs allow taxpayer dollars to be used to develop blighted areas. The group also accused the city of violating the state Open Meetings Act, among other allegations. Should Chicagoans Stop Throwing Money into a Giant Hole? A few weeks ago The Onion--America's finest (fake) news source--boldly asked the question: Should the government stop dumping money into a giant hole? "It's just like they say," said commentator Duncan Birch, "you have to throw money in a hole and set it on fire to make money." Of course, the piece was a parody of the dramatic increase in government spending in the form of bailouts, stimulus and whatnot, but there are real-life money holes here in Chicago.